Unsold EUR 173,55 Buy It Now or Best Offer, EUR 41,65 Shipping, 30-Day Returns, Pay with PayPal and you're fully protected. Seller: weytreasure (11.969) 100%, Location: dorset, Ships to: Worldwide, Item: 162972612954 This auction is for a double fusee ?? 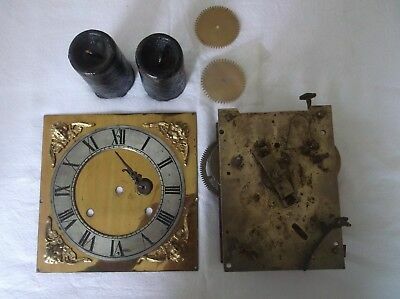 clock movement,hands,2 weights,cogs and a bracket clock face,the face measures 7" by 7",the movement measures 6.25" by 4.5",all sold as spares and repairs,just found in a house clearance,i will ship worldwide by insured couriers only. Popularity - 0 views, 0 views per day, 386 days on eBay. 0 sold, 1 available. 0 views, 0 views per day, 386 days on eBay. 0 sold, 1 available. Seller - 11.969+ items sold. 0% negative feedback. Top-Rated Seller! Ships on time with tracking, 0 problems with past sales. 11.969+ items sold. 0% negative feedback. Top-Rated Seller! Ships on time with tracking, 0 problems with past sales.